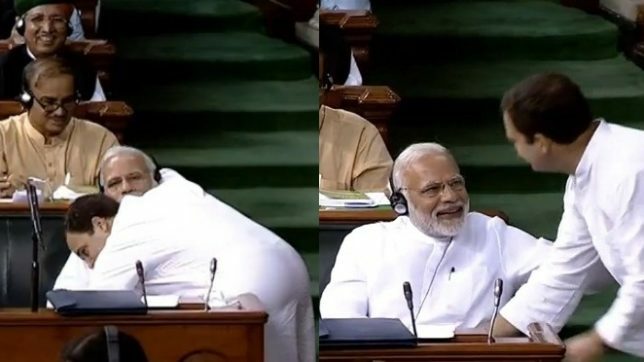 Rahul Gandhi’s ‘jaadu ki jhappi’ moment with Prime Minister Narendra Modi in the parliament drew mixed reactions from the Indian film fraternity, who found the “theatrics” worth a comment or two. Congress president on Friday surprised the Lok Sabha when after bitterly criticising the BJP-led government during the no-confidence motion, he walked across and hugged an unwilling Modi. To top that, he also winked at Modi — reminding the Twitter world of actress Priya Prakash Warrier who became a ‘national trend’ with her mischievous smile and wink in a song from Malayalam film “Oru Adaar Love”. “Wink! Wink! Hug! Hug! Nudge! Nudge! More Jaadu ki jhappi please,” Shobhaa De, who then called Gandhi’s gesture the “hug of the decade”. Bollywood actor Rajkummar Rao thought July 20 could officially be made “Hug Day”. “What a jhappi, Rahul! Hope it works its jaadu on recipient. Who’s next on the hug fest? Just shows hugs are not the PM’s monopoly,” De said, pointing at Modi’s knack for hugging world leaders.While displeased Speaker Sumitra Mahajan underlined that the code of conduct inside the House did not approve of Gandhi’s behaviour, some Bollywood celebrities questioned what was odd. Ad filmmaker Ram Subramanian said the problem with the hug was that it was a “a forced one” and sent “the wrong message”. Chandrababu Deeksha: Tea stains on Yellow shirts!